For a real estate evaluation, one can look for real estate appraisal order forms. The real estate property in question needs to be described in this form along with the loan information and order information. All the details are important as it is being ordered for an important process. 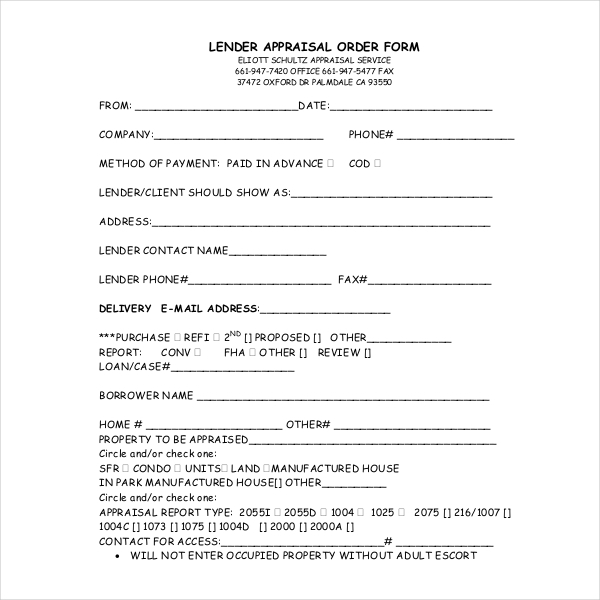 Mostly a property lender orders this form which is to be reviewed by a licensed appraiser. 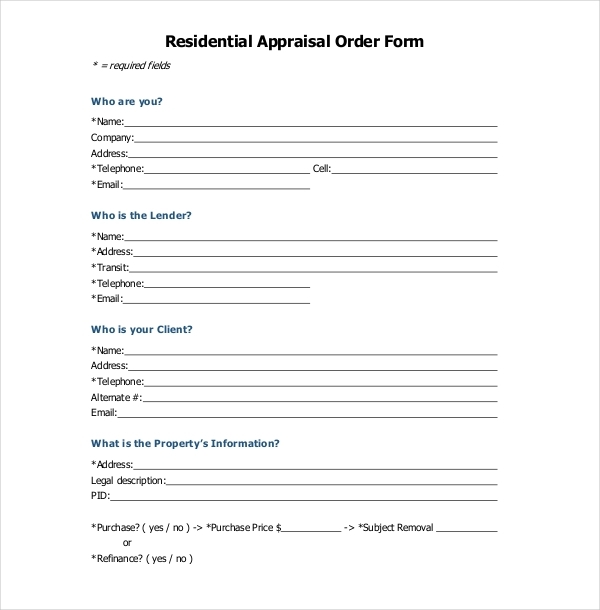 This kind of appraisal form can be used for ordering general evaluation forms for properties like condo, single-family, 2-4 family, exterior only, etc. appraisal review. Purpose of appraisal is asked along with details of loan and the person who orders it. The borrower’s name and details like purchase price of property, estimated value, refinance is asked. Failing to fill the mandatory details on the form will lead to rejection of the order. 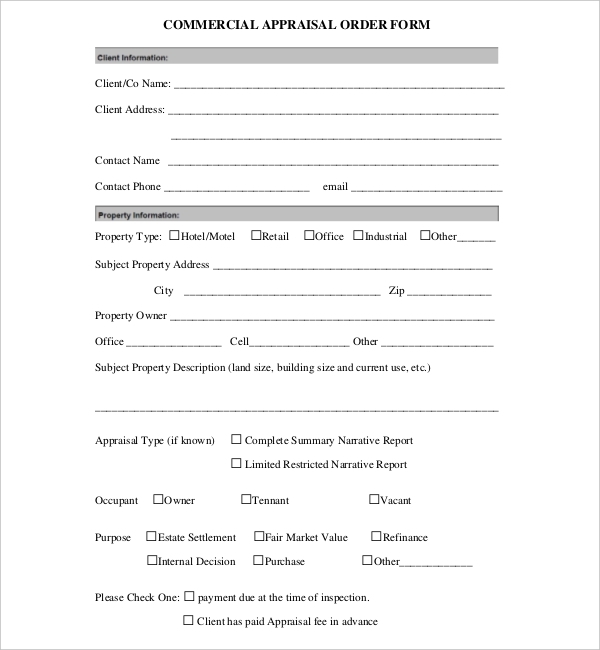 Commercial appraisal order forms are ordered by clients who are interested in reviewing properties for retail, office, hotel, industrial or other purposes. If they want the commercial appraisal to be reviewed by a legal reviewer, filling up this form would be helpful. Client can order the forms for a satisfactory review by the appraisal report reviewer so that further steps can be taken. This form needs to have all the details related to property and loan. It requires contact information along with billing details and delivery information. Properties that amount to more than one million dollar require another form so that additional details can be filled. Appraisal reports will then be evaluated accordingly. This form is for those who are seeking for VA appraisals only. In this form, the broker information and property information are required. The names of the lender, buyer and agent name is required with contact number. 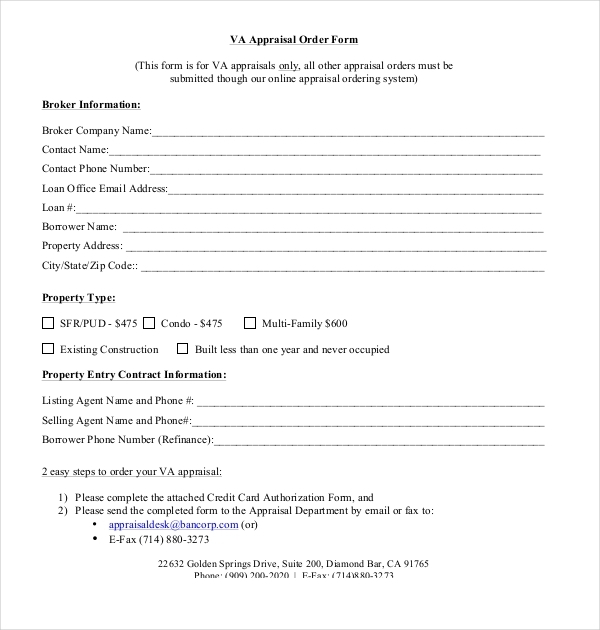 This is a unique form for evaluation which is financed by VA loans. A strict evaluation is done by the lender. A lender always chooses an appraiser to examine and make decisions about the property in question. This is because the bank’s money is in the loop. He/she will only approve the loan once a reviewer has investigated about the property. In this form, a lender’s contact name, loan details and many more information are asked. Since appraisal report is made for every property be it a residential one or a commercial one, an appraisal order form is necessary to fill so that the appraisal report is reviewed by a legal reviewer. For the purpose of loan sanction, these forms will be a useful paper to show to the bank that the money can be lent to the person concerned for the property in question. These forms are for the permission to ask for an appraisal form of any type (long/short) that can be used to review a property. Ordering the respective form will ensure that you went through the process of asking for an appraisal review. The order made for a form automatically means that you want a thorough and legal check of the property for the lenders to give you loan. Make sure that all the details in the appraisal order form is accurate. Any incorrect information will lead to rejection of the order. Any clarification needed to fill the form should be asked about so that there is no confusion about the forms. The relevant documents regarding the property must be present for proof of evidence and information. This is because some can use the information about the property in counterfeit cases. You can use these forms as per your requirements. 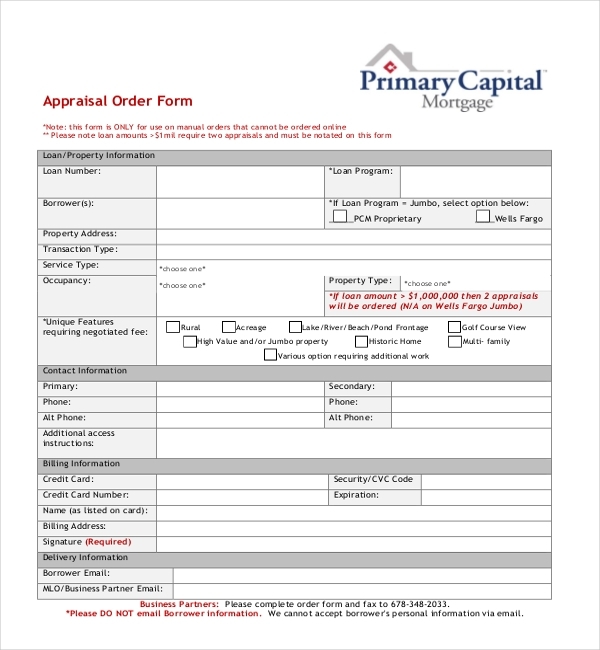 There are options to choose from, if you want a certain type of appraisal order forms. The forms must be carefully preserved in case the order does not arrive on time or does not arrive at all. Who can Use These Forms? These forms can be used by those people who are in need of loan against a particular property. These forms are mostly ordered by a lender but it is not same for all situations. 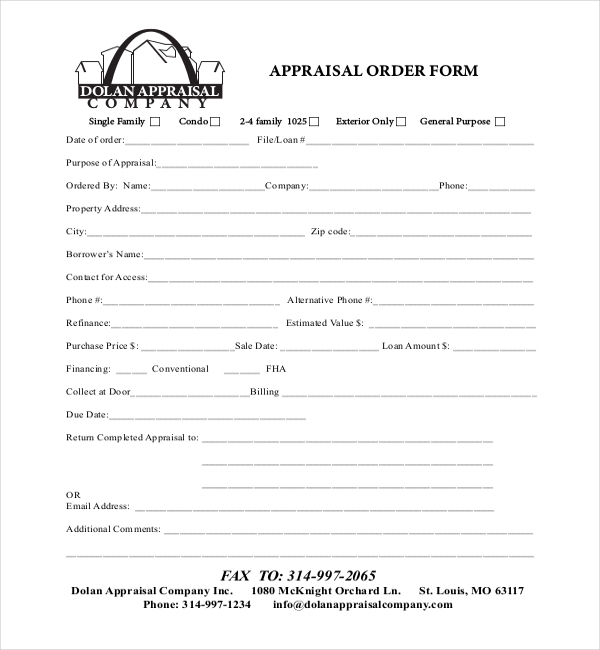 Appraisal order forms. It can also be used for consulting about the property. The appraisal order forms are the step before the appraisal review process. Anyone interested in lending a real estate, residential land, commercial property may use these forms to make an accurate review of the property for lenders and buyers. Appraisal – What is it? Appraisal relates to the valuation or study of a particular property or a thing. The determination of the value of the property is done by appraisers and that report is the reviewed by an appraisal reviewer. The property can be used for commercial, residential or any other use. It is a certain step for many other things like employee’s appraisal, performance appraisal, student appraisal, self-appraisal etc. These evaluations are necessary for government bodies, banks and investors in future. Appraisals are used for projects to determine the value of it. For example, Sales employee appraisal help to make a decision for an employee, if he has completed his target work within a given period or not. Based on an overall analysis, a decision is taken for his training. Appraisals can be used for evaluation of records from the previous set of records that were present. These old records can be referred to with the new ones for a comparing certain information. A cross review is beneficial to know the changes in either the property or a person. These appraisals can be used as an evidence for court, in case any problems arise. Hence, it is advisable to keep a copy of the appraisal report if possible. Appraisals generally have the initial assessment with regard to the property or person. Standards are looked upon which are met or not. The quality of the report, comparisons, rating scales, correction, reasons, further comments are given by the appraisal reviewer. After a thorough check, the appraisal report is either accepted for the next step or rejected. In case if it is rejected, the reasons are given for the rejection. It is to be noted that if the reviewer is found out that he was biased towards the lender or the appraisal report, there are strict actions taken against them. Hence, an appraiser must be an independent body. Signature of the official person with the date is essential for updates to the records. Appraisal review is a long and careful process. A lot of decisions depend on the appraisal report presented to the reviewer. Reviewing the appraisal report is a not an easy task. It takes a lot of time in judging the report in an independent manner. The order for such forms is a prior step to increase the accuracy of the information of the property by the appraisal reviewer. Once the ordered forms get delivered, the appraiser reviewer can start the assessment process accordingly. 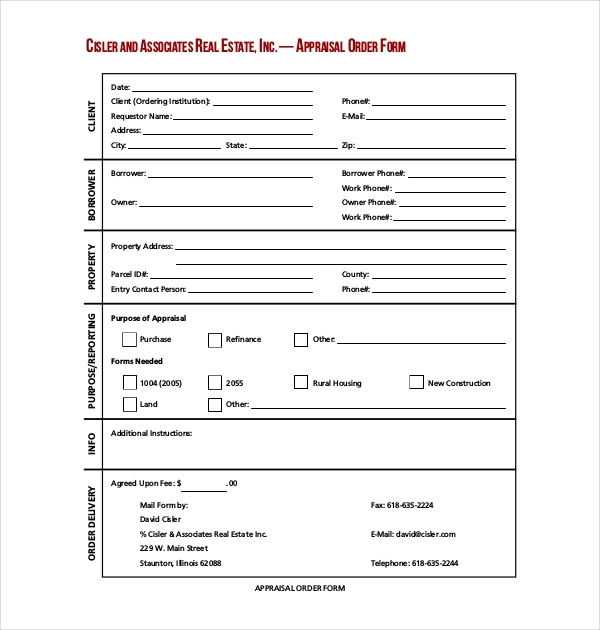 The appraiser can ask for any clarification needed to fill in such forms. There are a diverse group of templates available online for every purpose, so that the person concerned can utilize it for their benefit.